The Kapampangans are known for their sumptuous dishes. A Kapampangan cook depends on seasonal products like crops, livestock, marine life and the availability of local ingredients in the preparation of a dish. 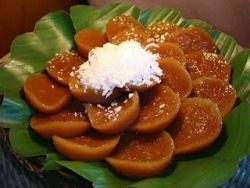 But Kapampangan Philippine desserts run all-year round! Barangay Cabalantian in Bacolor town remains to be the center of “kakanin” (cakes made of sticky rice) in the province. They have putu lasun (steamed rice cake), kutsinta (brown rice cake), all kinds of suman (sticky rice wrapped in either banana or coconut leaves), all kinds of kalamay (sweetened rice cake), nasi (plain rice), inangit (sticky rice stirred in frying pan), tapung (fine rice), biko (sweetened rice cake relished with flavors), duman (usually green sticky rice) and ale (jalea). The town of Candaba, on the other hand, is known for its brazo dela reina or brazo de mais, custard- filled roll of ground cashew nuts. This mixture is encased in a shell shaped like grilled corn but made of meringue. The best turrones de kasuy (a bar of marzipan made with cashew nuts, and wrapped in white wafer), silvanas (buttered cookies) and sans rival (layered crisp meringue filled and covered with buttercream) can all be bought in the town of Sta Rita. All kinds of tarts locally called bangca-bangca (boat-shaped tarts) and batya-batya (washbowl-shaped tarts) are also available. In Sasmuan, there are selections of polvoron (a mixture of toasted flour, milk, butter, and sugar cooked and then molded), ube (water yam), pinipig (puffed rice), and milk. It offers the most delicious marzipan, turrones de pili (marzipan made with pili nuts) and pituclip-tuclip, a kind of kalamay made of malagkit (sticky rice) flavored with ube (water yam) and aniseed, steamed into flat squares, filled with "latik" (solidified coconut milk through frying) and folded onto itself. Aiza’s Sweets in Purok Roxas, Barangay Sto. Tomas, Sasmuan town sells these goodies. Round, large samani or caramelized peanuts can be bought from Arayat town. Pastillas de leche (carabao milk candy), yemas (a dessert made from milk that has been set with rennet) and tibuc-tibuc which is flan- like custard made of carabao’s milk, galapong (milled glutinous rice) and lemon rind are the pride of Magalang. Contact Carreon’s Sweets and Pastries and Pabalan Delicacies, both in San Nicolas 1st, Magalang town for these delicacies. Mexico prides itself of the panecillos de San Nicolas (a kind of biscuit with embossed image of patron St. Nicholas), Angels’ Delight or Holy Angel cookies, the dulce prenda or hopiang kapampangnan (a flaky pastry with filling such as mongo) and the suclating batirul or native chocolate. If you are craving for puto seco (rice cookies) and espasol (a native delicacy made of sweet rice), proceed to Apalit and delight on the town's pride delicacies. Both the City of San Fernando and Angeles City sell empanadas or empanaditas (meat pie) and panara (bread). Neigboring Mabalacat is known for its galang-galang or oven -baked biscuit-type bread.